Thai pro-democracy factions on Tuesday moved to unite and thwart a junta-backed party from forming a government after the first election since a 2014 coup. The junta appeared to be in pole position to return to power as a civilian administration after preliminary results from Sunday's poll showed its proxy party had secured an unexpected majority of the popular vote. Around 7.6 million votes went to Phalang Pracharat with 94 percent of ballots tallied, the Election Commission has said. 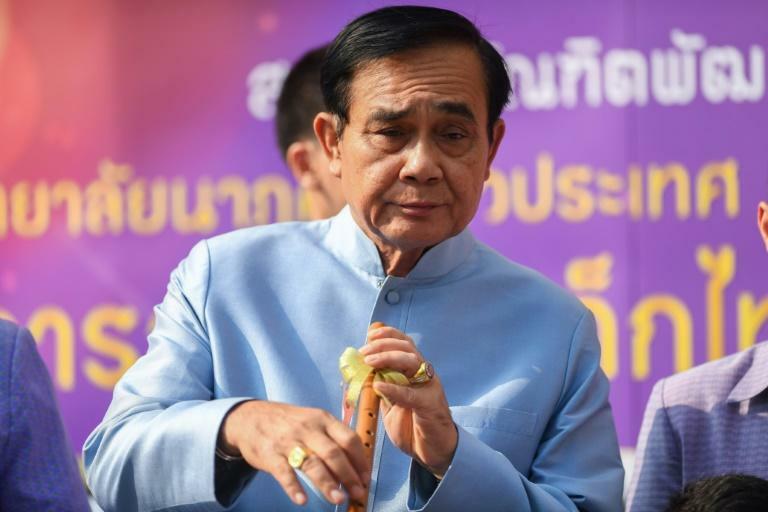 That gives it -- and its prime ministerial candidate, junta chief Prayut Chan-O-Cha -- a strong claim to legitimacy from a poll held under new junta-scripted rules. 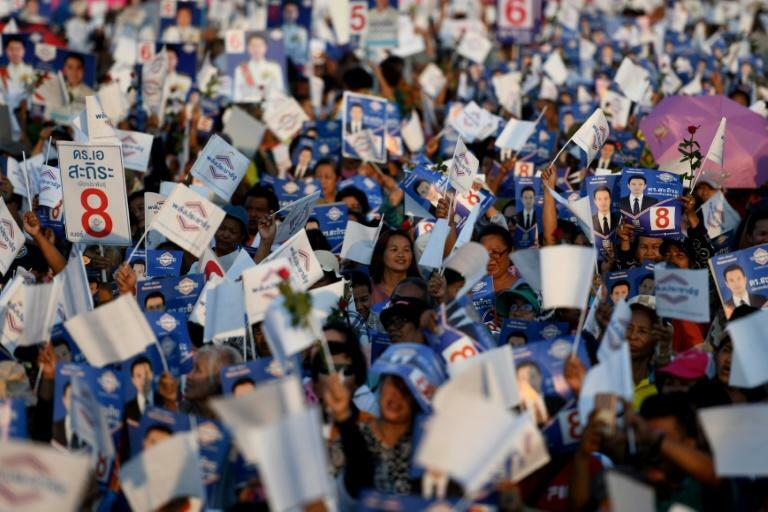 It is more than 400,000 ballots ahead of Pheu Thai, the populist party toppled from power by the 2014 coup and affiliated with self-exiled former premier Thaksin Shinawatra. But Pheu Thai still appeared set to become the largest party in the lower house, on track for 137 constituency seats compared to Phalang Pracharat's 97, according to early figures. It also was poised to receive a much-needed boost from other parties in the pro-democracy camp intent on creating an alliance. Future Forward, a youth-oriented force that took over five million votes, said in a statement late Tuesday that it would join "a coalition of parties opposing the prolonging" of junta rule. Those parties are expected to meet Wednesday to reveal more details. Under the stewardship of telegenic leader Thanathorn Juangroongruangkit, Future Forward won 30 constituency seats and is expected to collect more when separate party list seats are announced. Experts predict days -- perhaps weeks -- of messy negotiations, with both Pheu Thai and Phalang Pracharat claiming the right to form a government. Another smaller party, Bhumjaithai, the vehicle of a cabal of savvy billionaires whose allegiance shifts with the political winds, is likely to be crucial in swinging a lower house majority towards or against the junta party. It has proposed Anutin Charnvirakul, 52, for prime minister and trailed promises of boosting rural incomes across the northeast by allowing medicinal cannabis to be grown. Seen as a rare compromise figure across a political landscape bisected by personal hatreds, he was once a senior official in a Shinawatra party. Disqualifications of candidates and disputes over poll irregularities are likely to reshape the balance of the 500-seat lower house before May 9, when final results are to be published. As the horse-trading plays out, questions are also swirling over election irregularities, with millions of invalidated ballots, dodgy oversight of polling and bungling by election authorities that may have wildly skewed initial numbers. The Election Commission is also releasing the results in a staggered fashion, claiming "human error" when reporters pointed out that a handful of provinces returned more ballots than the voter turnout. Regional election monitor ANFREL announced Tuesday in a statement the initial ballot tabulation process was "deeply flawed", which did "further damage to the perceived integrity" and public trust in the results. "It is very confusing and someone needs to clarify it," said Watcharee Chanpeng, a 41-year-old voter in Bangkok. The United States said Tuesday that it saw "positive signs" of a return to democracy in the country, but urged a transparent probe of allegedly widespread irregularities. "The voting along with, we note, robust media coverage of the process and open debate of its merits, those are positive signs for a return to a democratic government that reflects the will of the people," State Department spokesman Robert Palladino told reporters. Even against a coalition the junta is not finished. 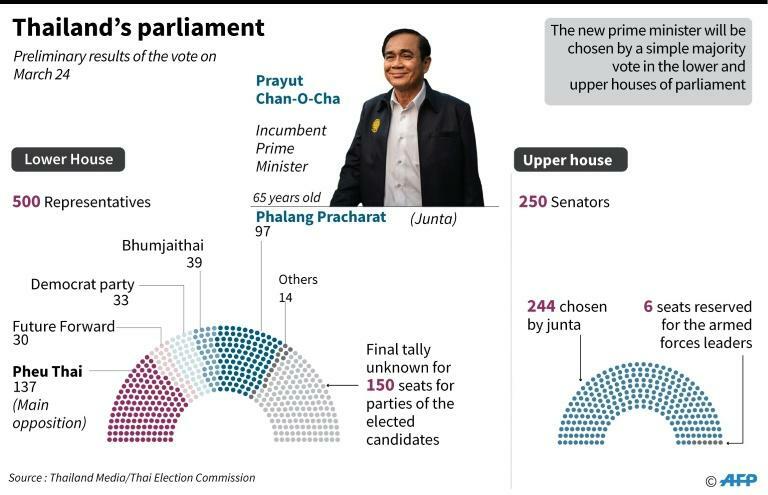 Apart from other parties that have yet to declare their intentions, Phalang Pracharat has the advantage of a 250-member military-appointed upper house or senate that has a say in voting for the next prime minister. Prayut, a stern army chief who engaged in increasingly bizarre publicity stunts ahead of the polls as part of an image-makeover, told reporters Tuesday he would "put this country on the road to unity and reconciliation to move the country forward". Thaksin sits at the heart of Thailand's political rupture. His parties had won all elections since 2001 with votes from the poor, in the process unsettling the Bangkok-centric elite and their royalist army allies who have struck back with coups and court cases. On Monday he told AFP in Hong Kong he believed the polls were "rigged" and riddled with "irregularities."